I get a lot of pleasure from going to the garden, filling a basket with vegetables and carrying it back to the kitchen. 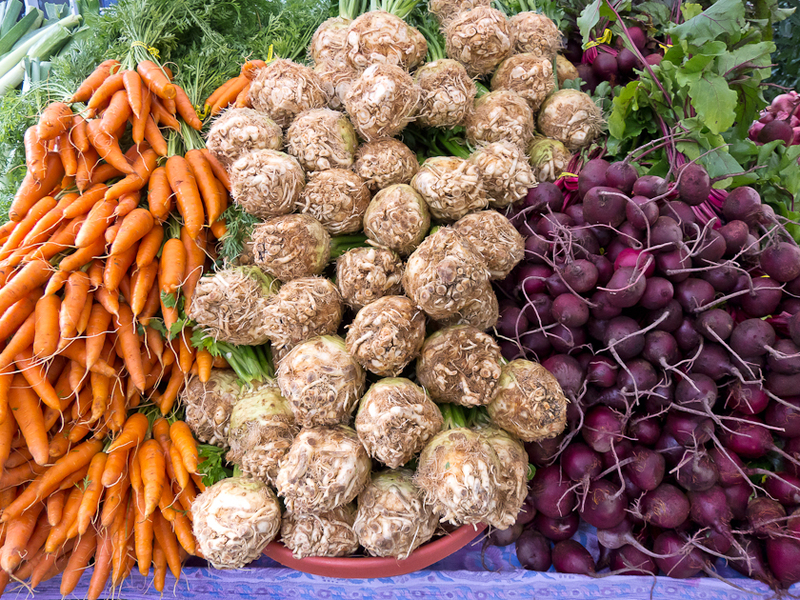 The colors, textures, shapes, and sizes of this abundance create a vegetable still life, inspiring both in its beauty and in the cooking and eating possibilities it suggests. 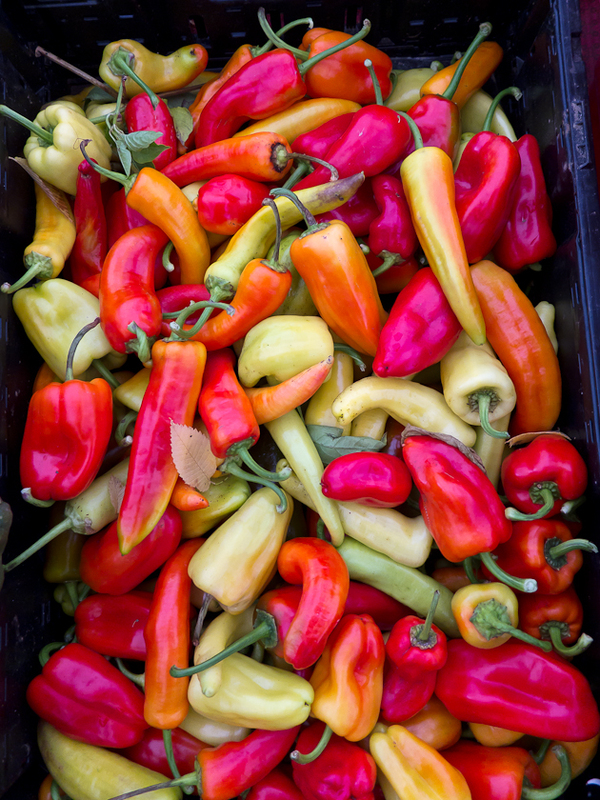 This kind of pleasure is multiplied many times over by a walk through a farmers’ market. Last weekend we were in Portland, Oregon and went to the Saturday market downtown. 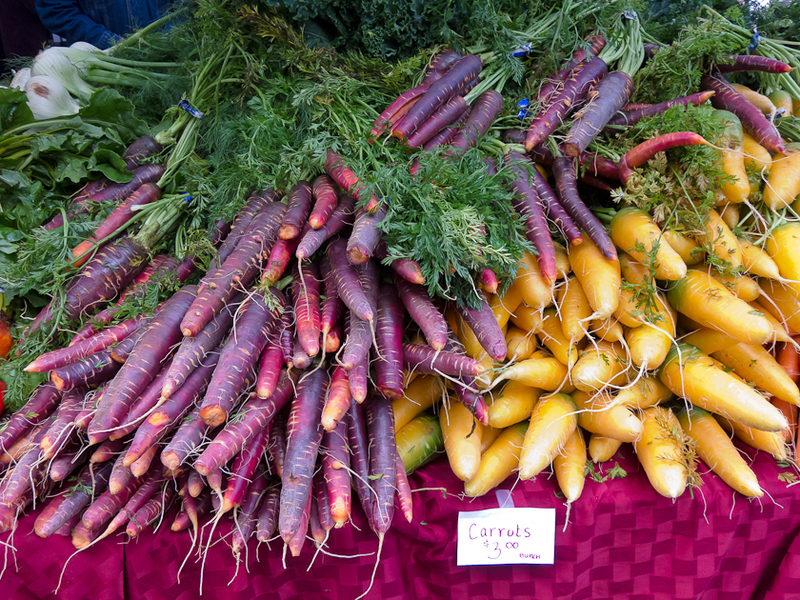 It’s one of our favorite farmers’ markets and a highlight of a visit to Portland. The city park setting with its green lawns, tall trees and rows of farmer’s stalls spilling out gorgeous, fresh produce always makes me think that if I lived here and didn’t have a garden I’d still be fine. 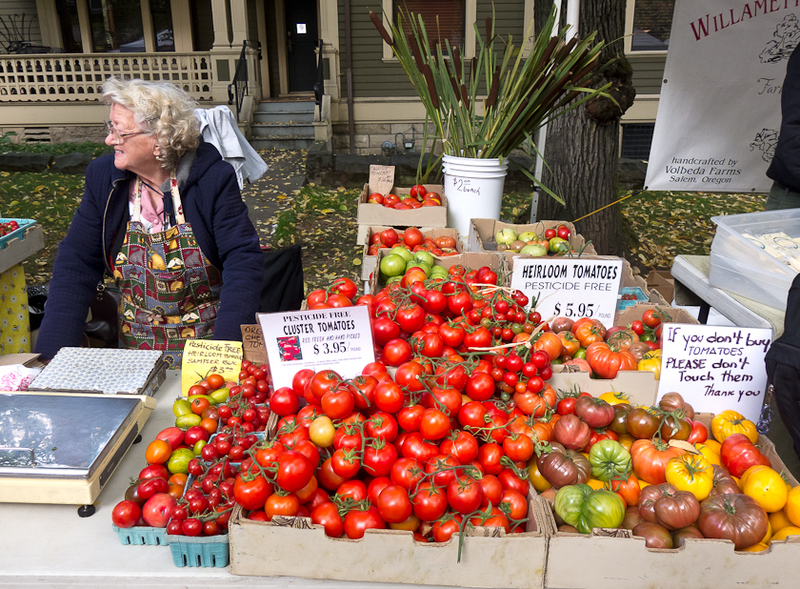 I would face the dilemma that Portland market shoppers face at this time of year though, as the summer produce is winding down and fall and winter crops are coming in. 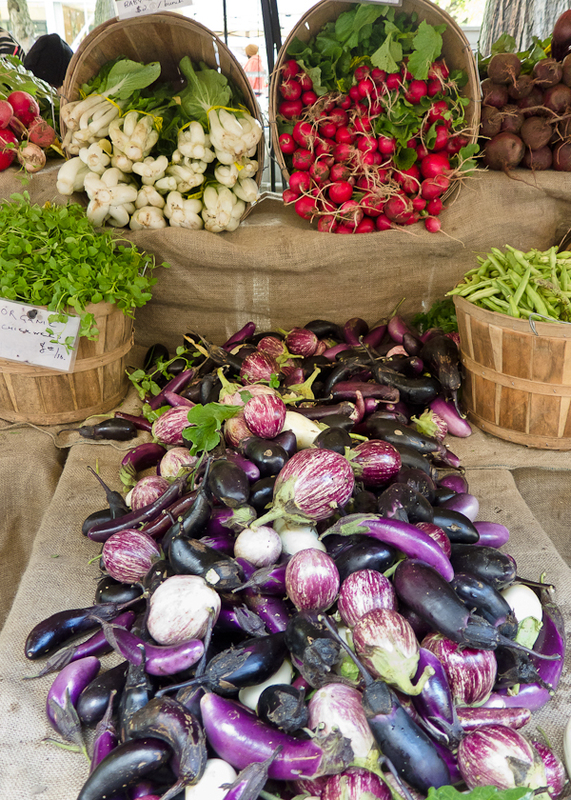 Do I stand in line for late summer vegetables and make one last batch of caponata? Eggplant, peppers and tomatoes are still on offer. 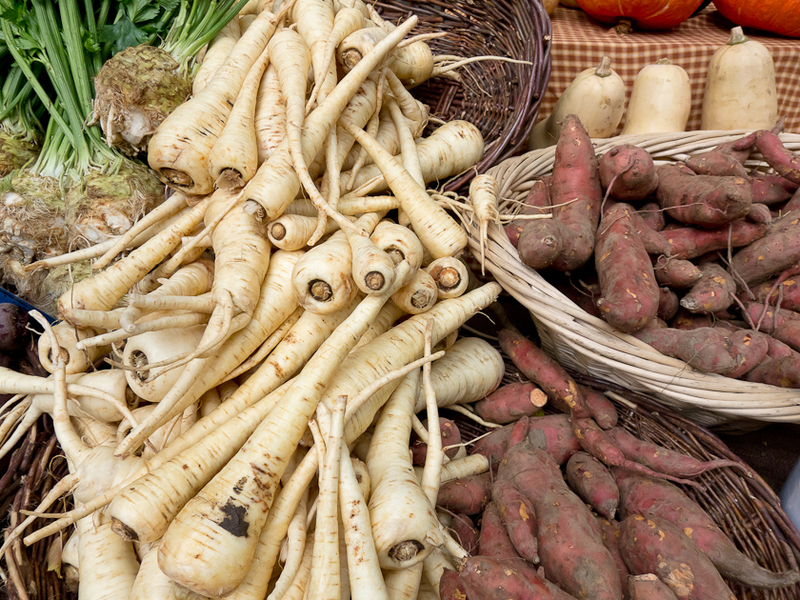 Or do I join the lines for fall carrots, beets, celery root, parsnips and sweet potatoes and make the first batch of roasted roots? Either choice would match perfectly with beans. 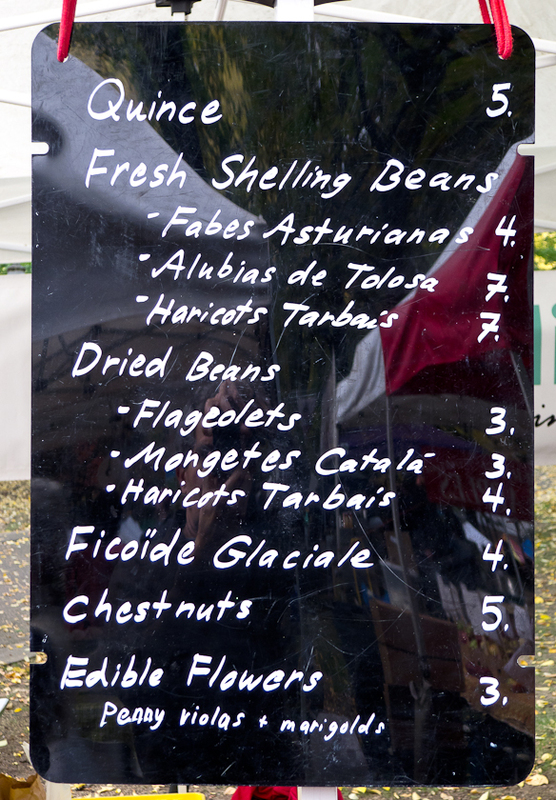 What a treat to find fresh shell beans at the Viridian Farms stall. 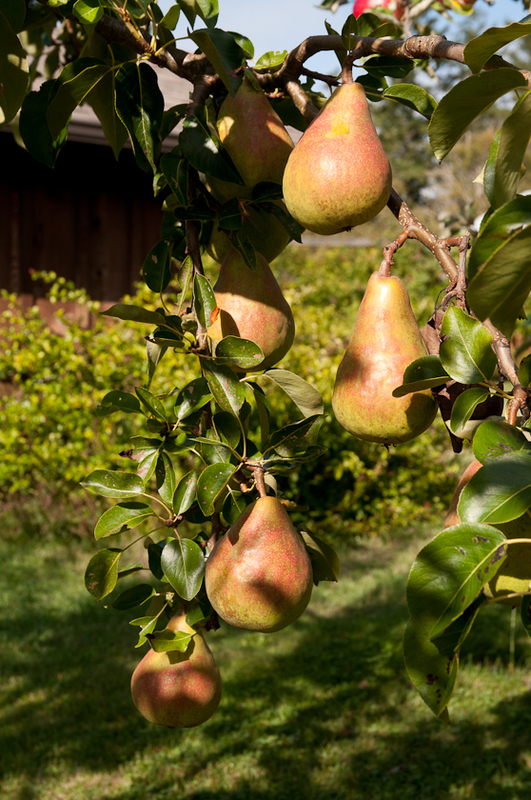 As their website http://www.viridianfarms.com/ explains, they seek out heirloom seeds from southern Europe. 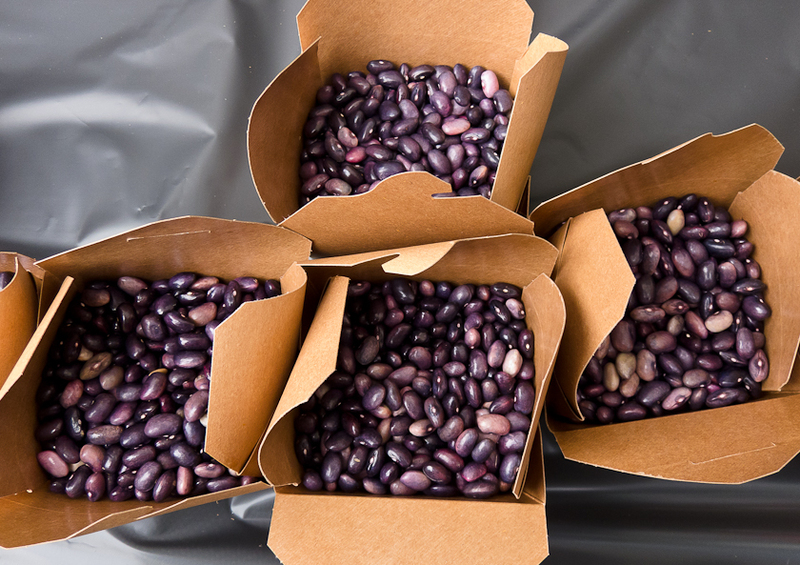 The purple beans are Alubias de Tolosa, a Basque bean. 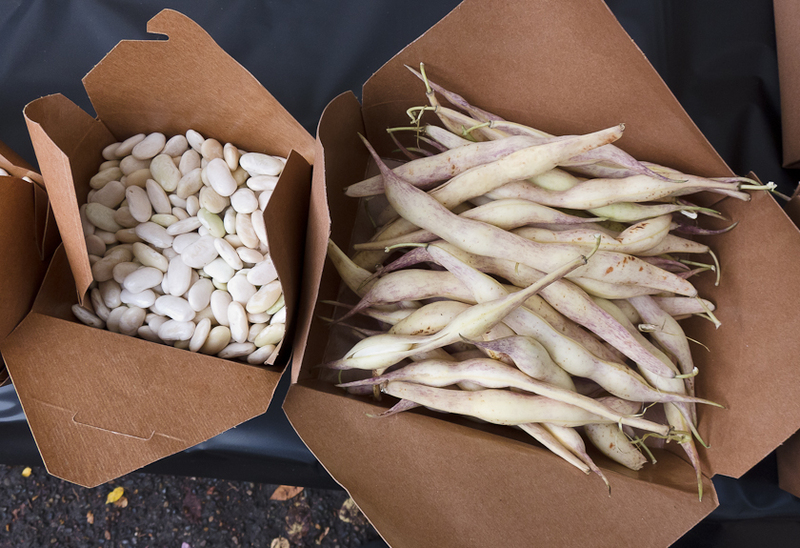 The white beans are Haricots Tarbais grown in southwest France and used for cassoulet. And the beans still in the pod are Fabes Asturianas, so large that the Viridian Farm’s shelling machine can’t handle them; you have to shell them by hand. They are the base for a classic Spanish bean, pork and sausage stew. I could be a grateful, regular customer here and at all the other stands. 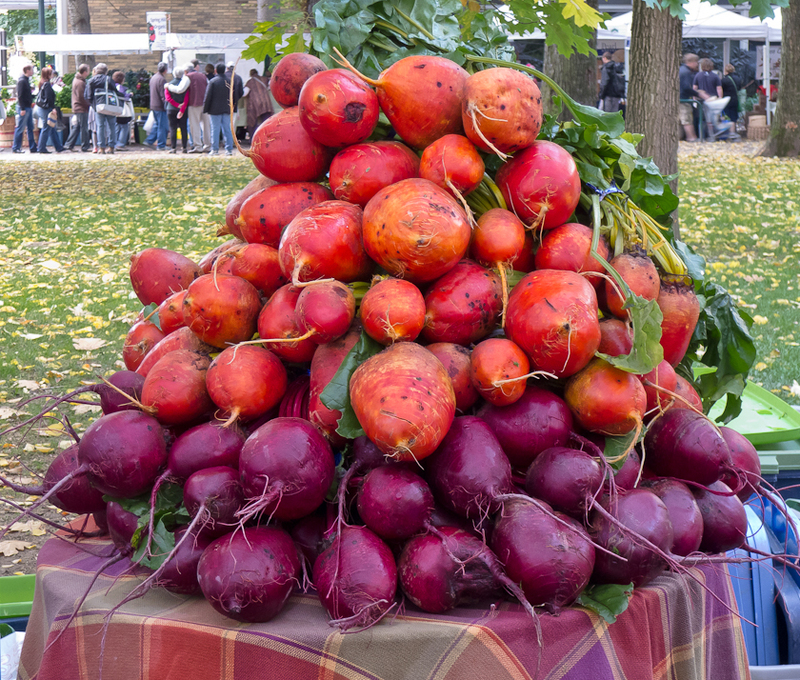 If Scott’s photos haven’t already shown you why we like this market so much, take a look at the Portland Farmers’ Market website to learn more about the farmers: http://www.portlandfarmersmarket.org/markets/psu/. It conveys the scope of this market and the Interactive Market Map gives a brief biography of each farm. Click on it to find stories of the people who grow these vegetables with such care and pride. If you don’t have a garden, a farmer’s market is a perfect alternative and a very tempting one even for those of us who garden. We call ourselves bean heads, others call us bean queens, but really my friend Carol and I just like growing and eating beans. 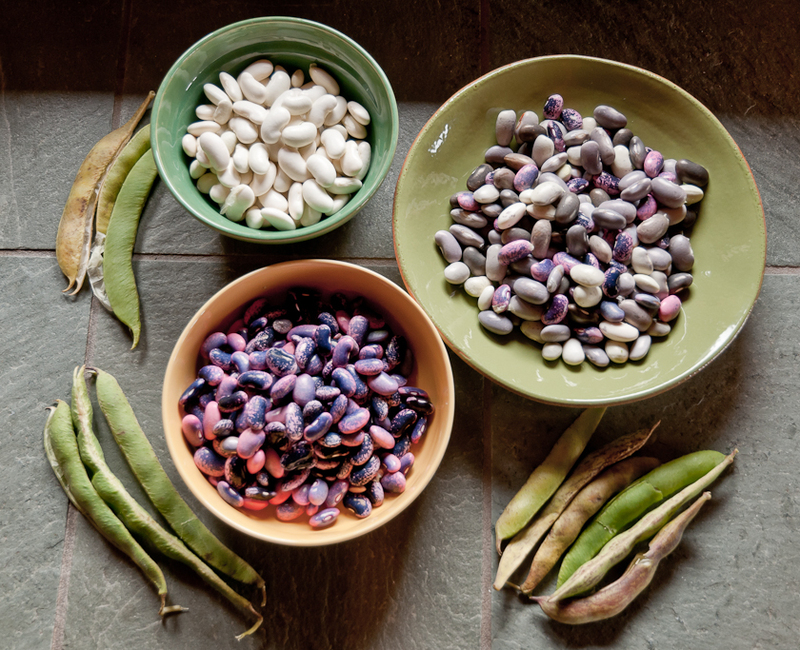 As I wrote a few years ago, beans have always had a place in my kitchen garden: https://lopezislandkitchengardens.wordpress.com/green-living-columns-2/beans/ and as Carol’s story reveals, she is an even more serious bean lover than I am: https://lopezislandkitchengardens.wordpress.com/yes-you-can-grow-dried-beans-on-lopez/. 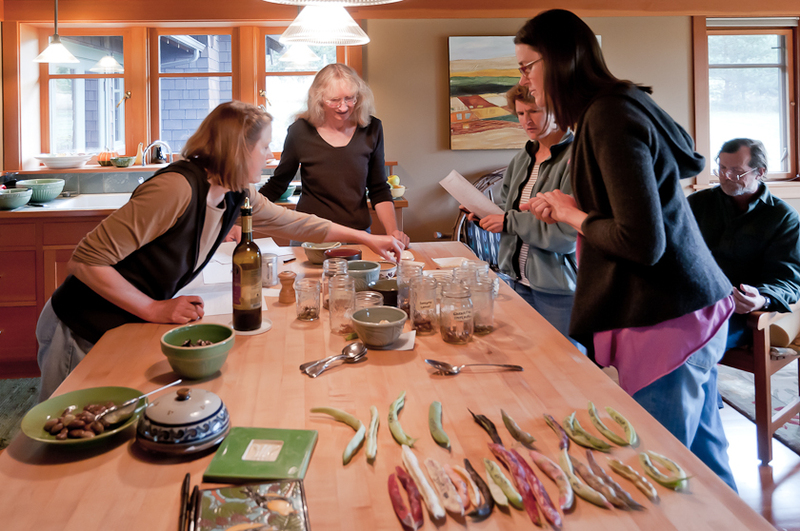 This past week, we drew a few friends into our love of beans with a bean tasting. 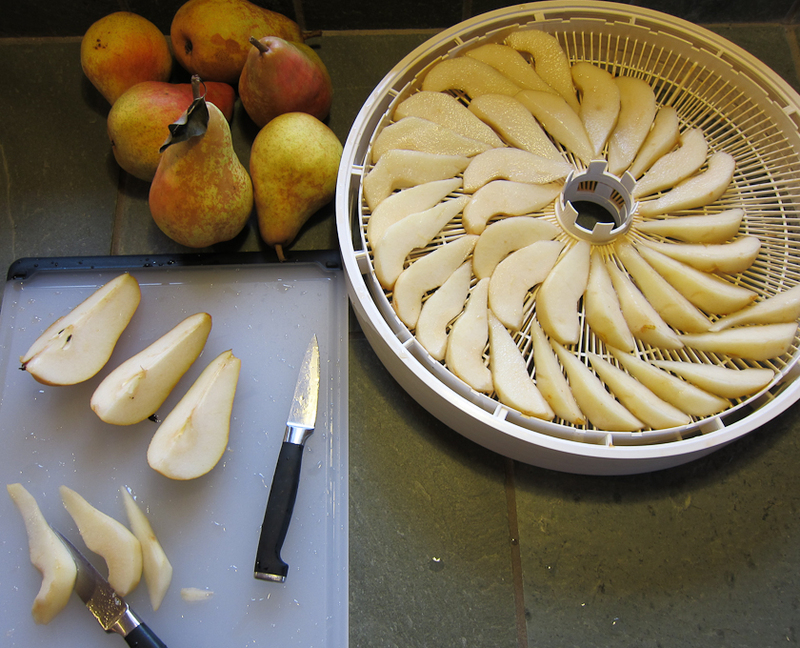 They don’t need to be soaked but just boiled until tender, anywhere from ten to twenty minutes depending on size. 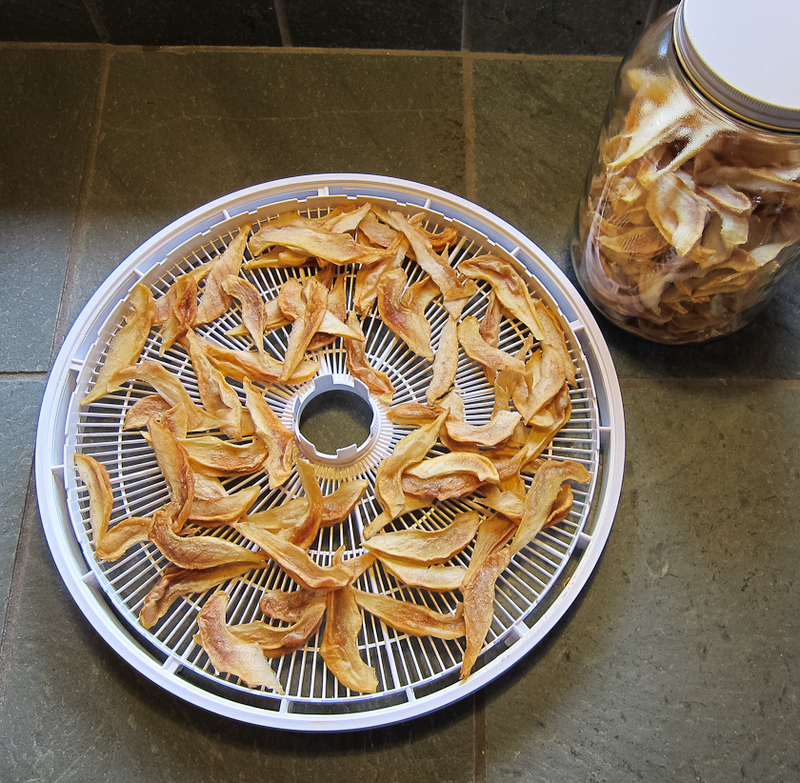 Any bean grown for drying can be eaten at the shell stage but as we discussed during our noontime tasting, many taste different, even taste better, at this fresh, shell stage. Carol and I cooked the beans just before the tasting and set them out in labeled bowls and jars. 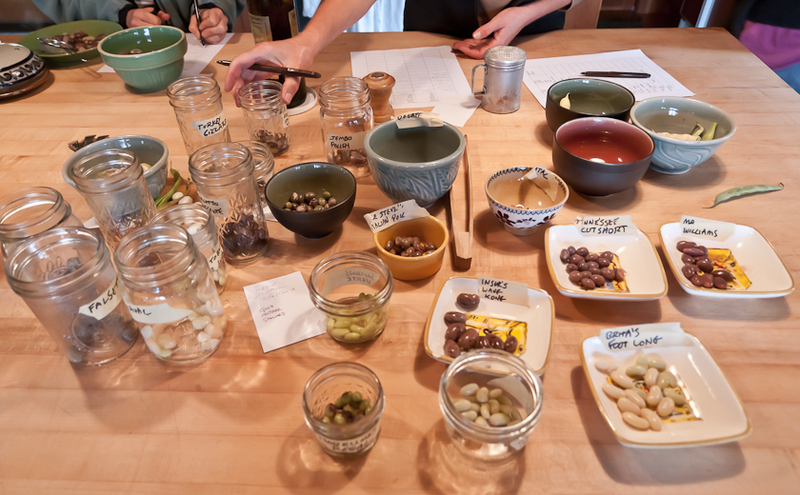 Armed with charts to record the name, flavor and texture of each bean, we all went to work. Even before tasting the beans, we delighted in their names. Next to homey names like Ma Williams, Good Mother Stallard, Uncle Steve’s Italian Pole and Aunt Jean’s Pole there were Turkey Gizzard, Tobacco Worm, Tennessee Cutshort, Uzice Speckled Wax, Zlatac, Insuk’s Wang Kong, Soissons Vert. All of these names reflect Carol’s focus this year on beans from Europe and Southern Appalachia. There were also three runner beans, Chestnut, Sunset and White, popular in Britain, Carol explained, and great choices for the Northwest because they are tolerant of cold and they taste good as green, shell or dry beans. As we tasted, we filled the flavor column with words like earthy, nutty, sweet, fresh, lima-like and the texture column with words like creamy, meaty, mealy, buttery, dry. Because Carol was growing just a few of each variety, our samples of each bean were small, sometimes a bean a piece, but that was enough to start to differentiate the beans from each other. The smaller beans tended to be milder in flavor and creamier in texture. The larger beans were more earthy, nutty and meaty. 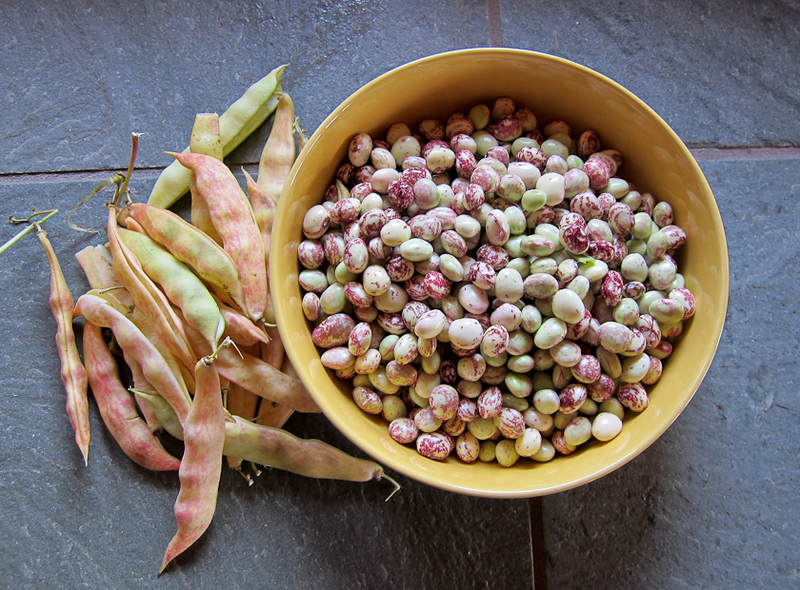 Lighter-colored beans tended to be milder while speckled and darker-colored beans were usually richer. Taking breaks from tasting, we admired the bean pods Carol had brought along, all labeled so we could match the pod with the bean. Part of the pleasure of growing beans is discovering what kind of bean is hidden within the pod. 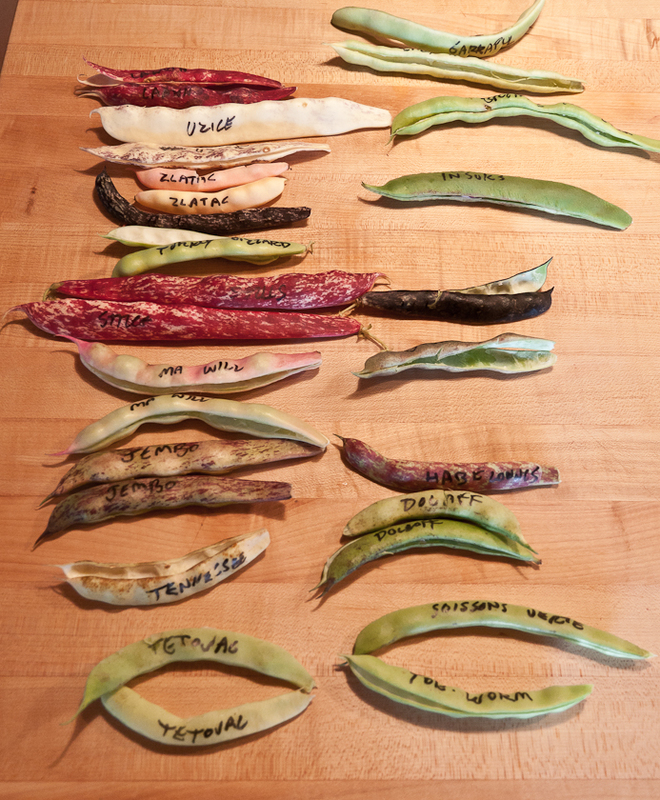 Sometimes there’s a match of pod and bean, especially with the dramatically striped red and white pods and beans, but often a drab pod hides a brightly colored bean. In the end, a few favorites emerged. One was Good Mother Stallard, a beautiful medium-sized nearly round red and white bean that reminded people of the flavor of pecans or hickory nuts. Another was Soissons Vert, a gorgeous green pole flagelot bean with a buttery flavor. And everyone liked the runner beans, perhaps because they were the biggest bean and usually the most colorful. 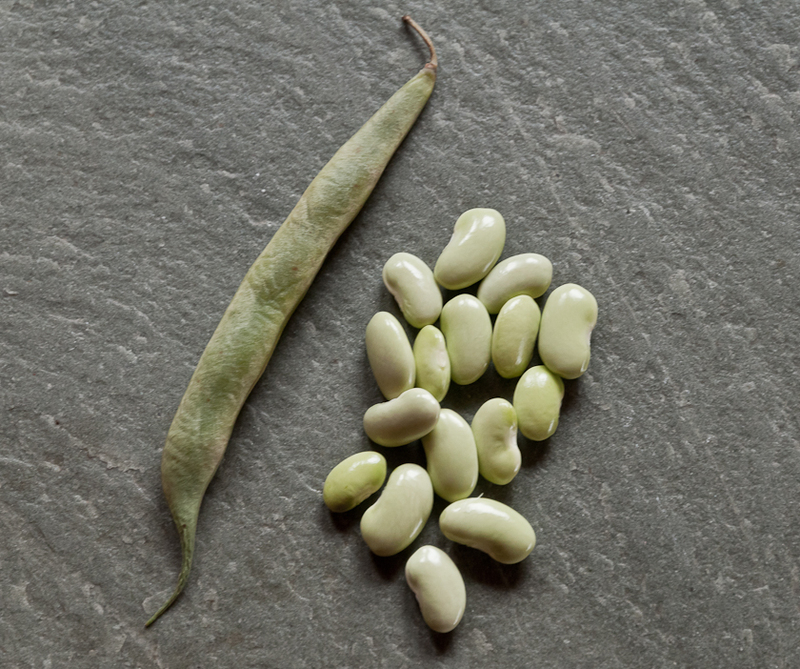 White, Sunset and a medley of Runner Beans At the end of our tasting, we mixed the remaining beans together, added them to a skillet of sweet corn kernels and enjoyed a lunch of succotash, one of the best reasons to grow shell beans. Carol plans to add the results of her 2011 bean trials to the 2010 trial and seed source information on file now in the reference section at the Lopez Island Library. If you want to grow dried beans on Lopez, and even start to call yourself a bean head, look for this useful information and start planning for next year.